Experience the Queen of the Pacific. The Honolulu Poster offers a gorgeous view of Waikiki Beach. Pink flowers bloom under the word “Aloha” against a green background of tropical plants. 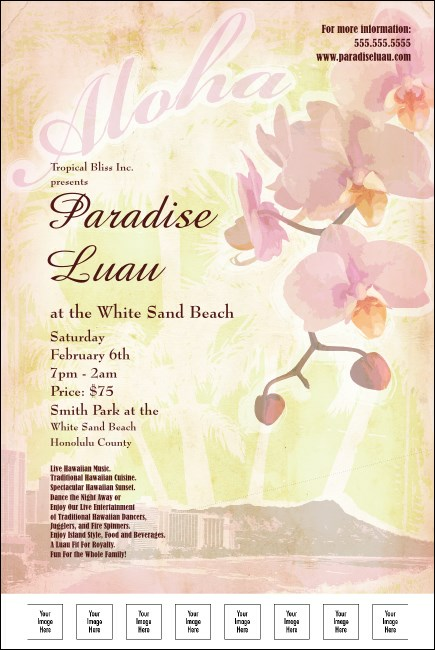 This poster template is ideal for Hawaiian events! Make it yours. Upload 8 custom images to promote your sponsors and performers through TicketPrinting.com.